FLINT, MI — Flint City Council is subpoenaing the Michigan Department of Environmental Quality to get answers on the flow of water funds from the state. 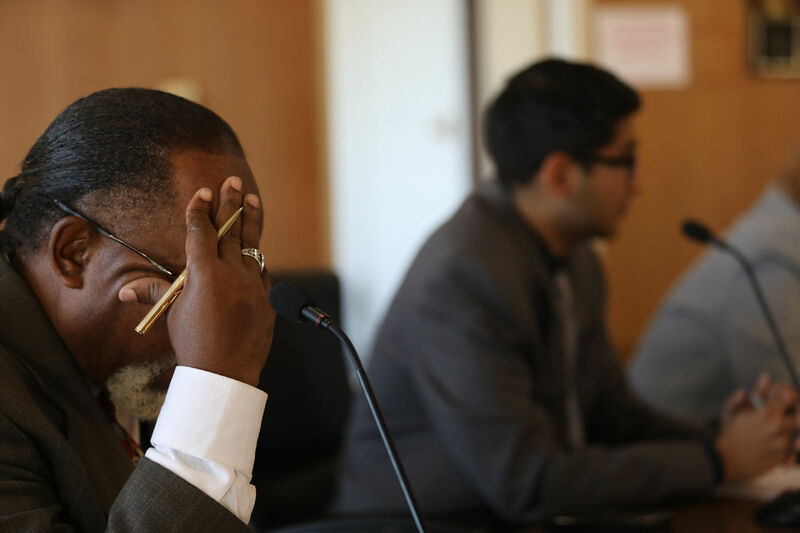 The decision to subpoena was made at a Oct. 24 Flint City Council hearing held to understand how state funds are flowing into and out of the city. According to a spokesperson for the MDEQ, contacted after the hearing, agency officials are willing to answer questions, just not by subpoena and under oath, as council has no power to compel that. The motion for the city attorney’s office to subpoena the MDEQ was made by 2nd Ward Councilman Maurice Davis and seconded by 3rd Ward Councilman Santino Guerra. It passed with 5-0 vote. The majority of the hearing was spent discussing and questioning the use of funds from the $97 million Concerned Pastors settlement awarded in 2017. Council members repeatedly referred to a Flint Journal/MLive article on the city’s service line replacement program’s current method to find lead lines. The city of Flint’s ban on a cost-effective tool and its method for finding lead water service pipes may mean it could run out of money before all its hazardous pipes are removed. Witnesses from AECOM and Joe Parks, a project manager for Goyette Mechanical, were summoned to the hearing, but AECOM didn’t show up. AECOM is a Los Angeles-based engineering firm contracted for $5 million to lead Flint’s FAST Start service line replacement program. Goyette Mechanical is one of five companies contracted to replace water service lines. AECOM sent a letter requesting two weeks before it would answer questions. Galloway motioned to ask that AECOM come before the council and answer their questions at a Nov. 7 hearing at 5 p.m., it was seconded by Councilman Davis and passed with a 5-0 vote. Goyette’s Parks was questioned about how homes are picked for excavations. AECOM assigned Goyette 1,200 homes, but Parks said he isn’t sure how those homes are chosen. Factors like a list of homes with active water accounts, maps and historic water cards are used to assign homes to contractors, according to The Flint Journal report. Parks said over 80 percent of the homes dug up by Goyette have uncovered copper service lines. Last year, only 20 percent of the homes dug up by the company found copper lines. Because Goyette is uncovering so much copper, which doesn’t need to be replaced, Parks anticipates there will be more than enough money left over in the $6 million contract for the city to pay the extra costs incurred by a policy change made in June. The policy change was made by Mayor Karen Weaver to stop hydrovacing, which uses a high-pressure water and vacuum system to dig a hole. The company centered its bid around the hydrovac and didn’t expect to be forced to work without it, Parks said. In a cost change sent to the city, Goyette estimates it’ll incur $500,000 in extra costs by the end of the project if the ban on hydrovacing isn’t lifted. Weaver expressed concern at a June Flint Water Inter-agency Coordinating Committee meeting that a hydrovac might miss spliced lines. So far, contractors have found seven spliced lines. A spliced line is a lead or steel pipe that leaked and was patched using a “copper band-aid.” According to the city, the only way to be sure a spliced line isn’t missed is by digging 8 to 10-foot wide holes uncovering the pipe. But hydrovacing is just another means of digging that hole, said Parks. “We’re digging the same hole whether it’s with a hydrovac or a backhoe,” Parks said. The only differences in using a hydrovac are that it cuts the cost of digging significantly and it’s the safer method of digging around utility lines. Parks said a letter from Consumers Energy and DTE states hydrovacing is the perferred method of digging around gas lines. He also stated the cost of digging a hole using a hydrovac truck is $190, but without it the cost is about $1,700. The most efficient method of digging up pipes is a combination of shovels, backhoes and the hydrovacs, Parks said. “When you take away a tool from us that we planned on utilizing, it slows us down and makes the job more dangerous and expensive,” he said. So far, the city hasn’t agreed to pay the company the extra costs.